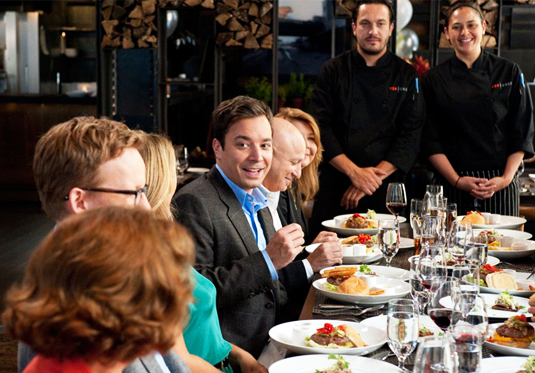 On to the elimination challenge, and the chefs would be surprised with a visit to 30 Rock to shoot live on Jimmy Fallon’s show. Talk about being thrown into the fire! They would be a part of Jimmy’s “cell phone shootout” where they would hold up their cell phone cameras and take a picture of rotating photos and whatever they landed on, they would have to cook that dish for Jimmy for his birthday lunch. Interesting. Well, Antonia was first and landed on beef tongue. EWWWWWWW. Fabio had burger and fries, which he kept referring to as “booger.” Carla got chicken pot pie, something that caused her to bounce off the walls like a pinball; Dale had Philly cheesesteak, Angelo pulled pork, Mike sausage and peppers, Tiffany chicken & dumplings; and Richard ramen. The lunch would be at Colicchio and Sons, the restaurant owned by judge Tom Colicchio, and he would be on hand as well as Padma and Gail Simmons; and also Jimmy Fallon and his co-workers and family. And Jimmy would, of course, be a guest judge. It was a funny group, especially Jimmy’s sidekick, whose name escapes me, and his head writer. And while Jimmy wasn’t crazy about having to send someone home, he had to do it. He also would have the winner of the challenge on his show for a cooking segment, and the winner would also get a trip to Tokyo. Wow. So the favorites were Carla, whose excitement carried over into the actual cooking of the dish; Antonia, who somehow made beef tongue appealing; and Angelo, who married flavors like coffee and dill to the liking of everyone. The winner? Yep, Carla. She continued to bounce off the walls, but she deserved the right to do that. The least favorites were Tiffany (chicken and dumplings that were thin and soupy); Fabio (a “booger” that was more like meatloaf and dry, with a grainy cheese sauce); and Dale (too-salty sandwich). In the end, it was Fabio who was sent home, and Gail’s “that burger was not juicy” comment was the telling statement that wound up being Fabio’s undoing. But the guy was gracious in defeat, and if you want to read the story from his perspective, you have to read his blog—it’s hilarious, and you know he actually wrote the blog because you could hear him saying these words in this dialect.